Independent Dan Smith is running for mayor — literally. At 10 a.m. on a recent weekday, the 34-year-old newcomer to city politics has been up for hours, making phone calls, knocking on doors, even getting in some early-morning outdoor recreation. “Dan doesn’t have an ‘off’ switch,” Cioffi noted. “I know he sleeps, but not much.” No wonder the guy is still single. 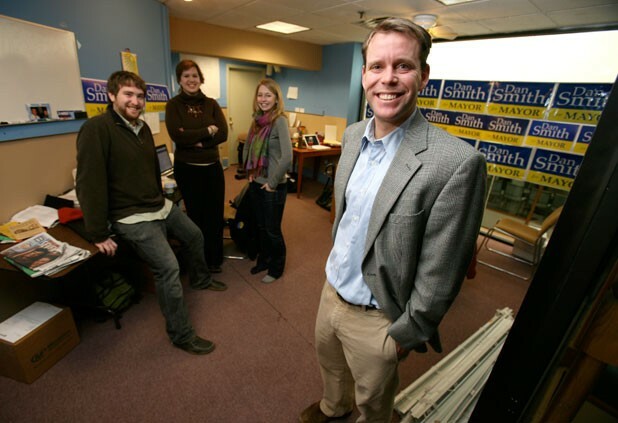 Smith’s campaign staff, based in the former offices of the Church Street Marketplace Commission, offers a glimpse into the young, 21st-century ethos of his campaign. His campaign manager, Emily Mellencamp Smith, is a 22-year-old fellow at Emily’s List, a national PAC dedicated to getting Democratic, pro-choice women elected to office. She took a leave of absence from the organization to help her first cousin get elected. Smith’s field director is Jesse Bragg, also 22. He’s tapping away intently on his laptop, responding to a post on the “Smith for Mayor” Facebook page. Though the other major candidates all have websites, none is utilizing social networking sites as aggressively as Smith, who already claims more than 460 “supporters” on his Facebook page. Admittedly some, such as Seven Days political columnist Shay Totten, are probably there to stay informed about the candidate; others live outside Vermont’s borders. Still, the Smith team seems to have torn a page from Barack Obama’s playbook. But Smith’s politics cannot be pigeonholed that easily. His coalition of supporters, volunteers and campaign advisors come from across the political spectrum. They include moderate Democrats such as Sen. Hinda Miller (D-Chittenden); moderate Republicans along the lines of Burlington businessman Yves Bradley; Green Party progressives that include former city council candidate Rene Kaczka-Valliere; and political newcomers such as Ted Adler, founder of Union Street Media. Smith, an eighth-generation Vermonter, is the grandson of former state senator Frederick Smith and son of the former lieutenant governor and one-term congressman Peter Smith. An “Aiken Republican,” the latter lost his congressional seat to Bernie Sanders and hasn’t been involved in state politics for 18 years. Though Dan Smith is new to Queen City politics, he’s well known to a couple of statewide candidates. They include 2006 GOP congressional candidate Martha Rainville, whom Smith coached on debate prep, and Gov. Jim Douglas. Smith worked for the governor briefly as a staff attorney shortly after graduating from law school. In fact, since announcing his candidacy last December, Smith has made his independent status the centerpiece of his campaign, touting his willingness to “embrace good ideas, no matter where they come from,” and his desire to offer Burlingtonians “a clean slate” in city hall. Bradley sees in Smith an opportunity for “something really new” in the city’s leadership. Adler, 32, sees similarities between Smith’s candidacy and Obama’s — from his youth and nonpartisan approach, to his comfort level with new technologies. Thus far, Smith has run an impressive race. As the wild-card candidate in the election, his presence has made this the most exciting and unpredictable city race in years. Smith is the youngest of the candidates, and arguably the most charismatic. Working crowds of all sizes, he comes across as a polished and articulate speaker who displays a depth of understanding of the issues and a facility at converting his shortcomings into strengths. For instance, Smith lacks the neighborhood support enjoyed by his more established rivals, notably Republican Kurt Wright in the New North End and Democrat Andy Montroll in the Hill Section. But Smith, who has lived in Burlington’s South End since October 2003, spins that apparent weakness as an advantage. Dan Smith was born on February 6, 1975, one of three children. He grew up in Middlesex until age 15, when his family moved to Arlington, Virginia. Smith often spent his summers at the family’s camp in Colchester. Later, he attended Phillip’s Academy at Andover, an elite Massachusetts boarding school whose blueblood alumni include Oliver Wendell Holmes, John F. Kennedy Jr. and both presidents Bush. Though Smith doesn’t dwell on his upbringing in a political household, it’s clearly helped shape his public persona. “I think you develop a real comfort level being in the public eye and having people talk about you,” he said. And, like any savvy politician, Smith uses a question about his past to stay on message. Smith graduated from the University of Virginia in 1997, then spent two years as a ski bum in Colorado. There, he got involved in mentoring at-risk youth, an avocation he’s kept up ever since. Smith is now president of the board at Mobius, a countywide umbrella organization for youth-mentoring programs. The University of Virginia School of Law came next and, upon graduation in 2002, Smith took a position clerking for then Vermont Supreme Court Justice Jim Morse. The now-retired judge said he “enjoyed working with Dan very much” and described him as “a Renaissance guy. Smith’s clerkship was cut short in 2002, however, when Morse was tapped by newly elected Governor Douglas to become commissioner of the Department of Social and Rehabilitation Services (now the Department for Children and Families). With six months left on his clerkship, Smith went to work on the governor’s legal team — a credential that’s notably absent from both his website and his Facebook page. Smith went on to work at the Burlington law firm of Downs Rachlin Martin, where he often lobbied state lawmakers on behalf of his clients — notably, the Lake Champlain Regional Chamber of Commerce and his future employer, GBIC. Representative Tony Klein confirms that assessment. The Democrat from central Vermont, who chairs the House Natural Resources and Energy Committee, credits Smith with helping him on several important pieces of legislation, including permit reform, the development of business “growth centers,” and affordable housing. It’s worth noting that Klein is a longtime family friend of Smith’s, worked with the candidate’s father, and managed his father’s campaign for lieutenant governor. Senator Ginny Lyons (D-Chittenden) got a somewhat different impression of Smith as chair of the Senate Natural Resources and Energy Committee. Although she describes him as “a very personable and likeable guy who’s got a lot of energy and enthusiasm,” she says she occasionally “bumped heads” with GBIC and the chamber on environmental legislation. For instance, both pro-business groups supported on-the-record review of environmental appeals, a procedural process that Lyons says tends to limit citizen participation. Chris Kilian of the Conservation Law Foundation’s Vermont Advocacy Center claims to have “a fair bit of knowledge” about Smith’s lobbying efforts in Montpelier. Not surprisingly, he has little positive to say about the goals Smith pursued on behalf of GBIC and the Lake Champlain Regional Chamber of Commerce. “If someone had come to me out of the blue and asked me to list 10 Vermonters who are green and oriented toward sustainability, I can say with certainty that Dan Smith’s name wouldn’t show up on that list,” Kilian said. Asked if his environmental goals as Burlington’s mayor would differ substantively from those of the chamber and GBIC — Smith was vice president of the economic development organization until October, when he resigned to run for mayor — Smith hedged on his answer. “My personal goals are for us, as a community, to take a regional view toward smart growth, which is encouraging economic development and opportunities to occur in our downtown, so that we can avoid the conversion of open space outside of our communities,” he said. Pressed further, Smith clarified his position: “Are my personal goals consistent with the concept that we can drive our economy while also taking care of the environment? I absolutely believe that,” he said, “I’m not going to try to roll back environmental protections . . . I believe we can grow within the rules.